Cashback Reward : Earn up to 10$! Deoxyribonuclease I (DNase I) is an endonuclease that degrades double- and single-stranded DNA and chromatin. It functions by hydrolyzing phosphodiester linkages, producing mono and oligonucleotides with a 5’-phosphate and a 3’-hydroxyl group. 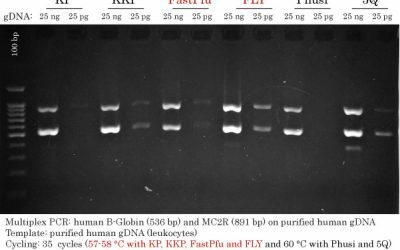 Ribonuclease has been reduced to non-detectable levels. Its activity depends on Mg2+ or Mn2+ ion. DNase I with Mg2+ randomly cuts double stranded DNA at any sites, DNase I with Mn2+ cuts double stranded DNA at the same site to form sticky ends with 1-2 nucleotide overhangs or blunt ends. DNase I is included in most of our RNA extraction kits. 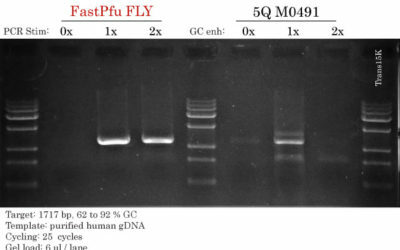 One unit is the amount of enzyme required to completely degrade 1 μg pBR322 plasmid DNA in 10 minutes at 37°C.